Everything I know about breakfast I learned from my father. It was he who fed me those early school mornings, at least when he was in town. I took care of myself when he was not because my mother was not exactly a morning person. 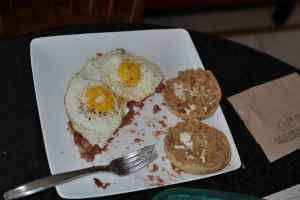 The fare was simple: Either scrambled eggs liberally dosed with sauteed jalapeños or fried eggs, sunny-side up on toast. But the best was sunday brunch: omelets, pancakes or my all time favorite: corned-beef hash. Yes, that's right! I'm talking about breakfast in a can. I still enjoy it to this day. 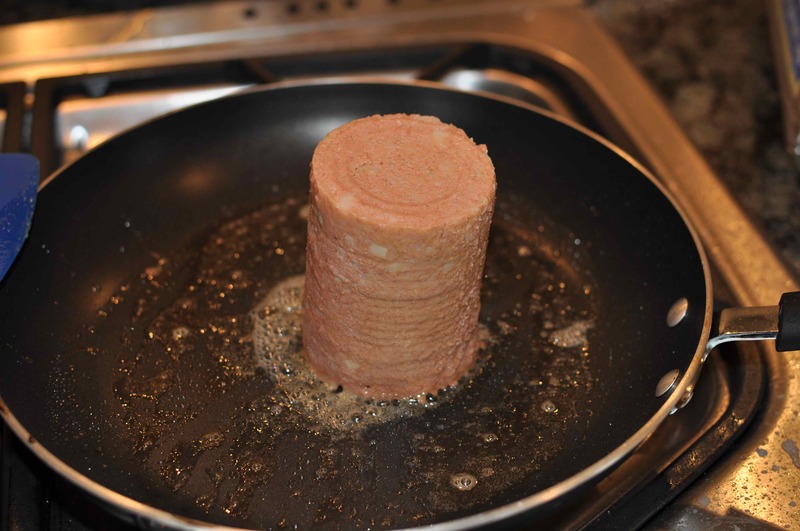 Open up the can and plop it right into the frying pan. Sure, it looks like dog food (may even taste like it, for all I know), but when it's done right — the perfect balance between the crispy outside and warm, soft inside — it starts my day off very well, thank you. I'm not claiming this is better than home-made, which it's not. Just that the ratio of work to joy is quite favorable. You need some left over meat. I only make hash when I have some leftovers. The meat needs to be cooked before you start, so it doesn't make sense, to me at least, to set out to make this from scratch. Any meat will do. 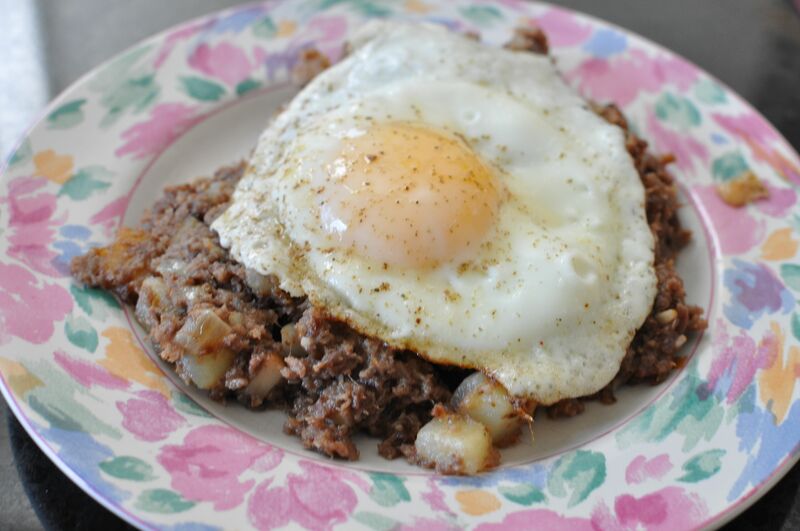 For me, it's usually a left over roast beef of some sort, which is ironic since I don't like the canned roast beef hash, but have never made my own corned beef hash. I've used turkey after Thanksgiving and with ham after Easter, both worthwhile. Chop the meat up fine. I run it through my meat grinder once with the large die. You could just use a knife. 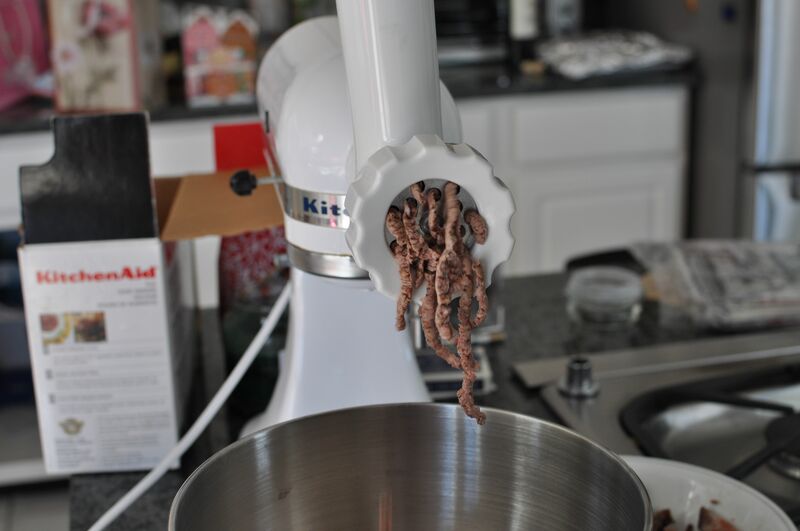 I wouldn't recommend the food processor because it will turn the meat into a paste that isn't very tasty. You need the starch in there. Well I do, anyways. It ain't breakfast without it. Don't limit yourself to the potato, though. If you have any other leftovers in the fridge that look like they might work, chop them up and toss them in there, too. You can't go wrong with onion, peppers of any sort, garlic. Just make sure you dice them up small. Toss all of the into a frying pan at medium heat with some butter or oil. 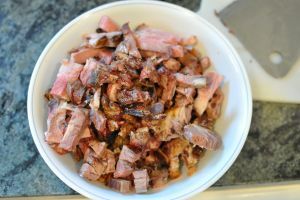 You might – might – be able to skip this step if your meat is particularly fatty, but even then, I wouldn't recommend it. Last thing you want is a dry, crumbly hash. You don't need much, a quarter cup or so should be enough. I've used my pig shots (2 ounces of pork broth), milk (yes!) or even gravy for my post Thanksgiving hash. Keep cooking until you get a crust, but not so long that it dries out. Throw a fried egg or two on top. Is It Worth Ordering when Eating Out? This is tough to answer for someone else because it depends on your willingness to suspend your disbelief. I know that the hash I order is coming out of a can most times I order it. Usually it works out just fine. The Yorkshire Diner in Manassas does it well. I enjoy it with a short stack of pancakes in addition to the usual sunny-side up eggs. This isn't always the case, though. I've had hash served without any crispiness, could still see the shape of the can. In other cases, I've been served a uniformly consistent paste. Where they try to make their own? Doesn't matter, it was a disaster either way. And this really pisses me off. This isn't hard to do. Despite the less than pleasant experiences, hash will always be on my menu. The warm fuzzy feelings it conjures, memories of my father, make it a tasty meal, even if it is from a can. A while back I was having dinner at a new place with colleagues after a particularly grueling week of work. Exhaustion and wine had combined to make me lose my focus in the conversation and I only came to attention when I heard someone say, "They have really good food here, I wonder how you can scale an operation like this to make some serious money." I smacked my hand down on the table and shouted, "You can't scale good food." Awkward silence, everyone in the restaurant looking at me. My friend asks, "Why not?" If I had read this book, I would have had a good answer, but I would have tempered my opinions somewhat. How food is created in America is a complicated story. There are clearly some bad guys who do not care for good food or the health of those who eat it, but it's not obvious who wears the white hats. Given that eating is something everyone does, the food market can only grow as fast as the population does. This means the only way for a corporation to profit at a Wall Street acceptable rate is some combination of lower cost of production and convincing consumers to spend more for the same thing or to eat more of it. The former means ruthlessly standardizing the production of food. Mr. Pollan ably demonstrates why this is destroying the environment and making us less healthy. As for convincing us to spend or eat more, that's not hard. We seem to be prey to all kinds of marketing gimmicks and health concerns which Corporate America has no problem stoking as they have just the antidote to sell us. The only way large organic concerns such as Whole Foods can work is to scale things up. This, ultimately, requires a standardized (there's that word again!) distribution network. Small farmers cannot reliably meet their demand, so only the large concerns succeed. Yes, it is true that this is healthier than regular industrial food production, but it is not environmentally sustainable and, arguably, uses more energy than non-organice food production. Part of the reason many farmers have gone industrial despite it being a losing business is that it is extremely easy. You only have to work for a small fraction of the year and you don't have to think much, industry tells you what to do and when. Sustainable farming that produces healthy food requires a lot effort and thinking in order to balance the diversity of plants and animals that a sustainable concern needs to manage. Those willing to do this deserve our support. I shall seek them out and give them my business. And why not? Sure, it will cost more money, but the food will taste so much better. I love meat. I always will, but that doesn't mean I condone maltreatment of animals. I have had difficulty arguing against folks such as the People for the Ethical Treatment of Animals. They seem to provide a good moral argument that's difficult to contradict. 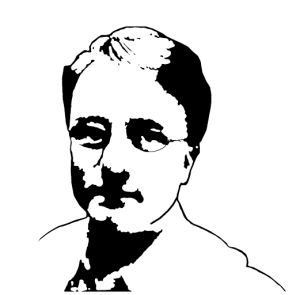 Mr. Pollan, though, does this well. I agree with his statement on page 328 of the paperback version of the book: "What's wrong with eating animals is the practice, not the principle." We can humanely raise and slaughter animals. Moreover, a healthy environment demands that animals are eaten. It's part of the cycle that we break at our own risk. The weak arguments that I did make to my workmates as to why good food shouldn't and can't be scaled were met with a shrug of their shoulders. "Why bother, then?" A good meal should be more than just a business proposition, more than just the sum of the ingredients that went into it. It's the appreciation of the effort, wonder at a magical combination of flavors and the joy of the people you share it with. I hope this wins out. 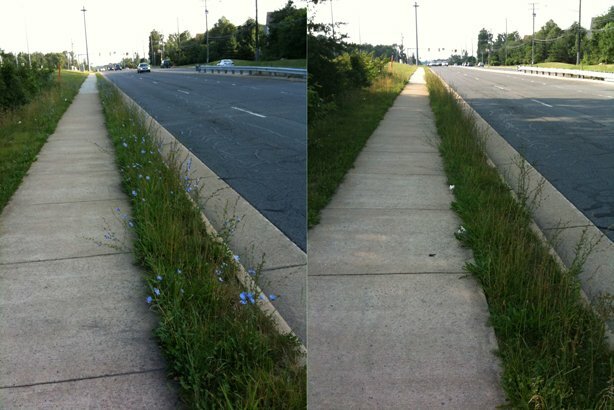 This pretty blue flower carpets much of the untended areas in Centreville. It caught my eye when I noticed that the flowers were open in the morning, but closed upon my return home from work. 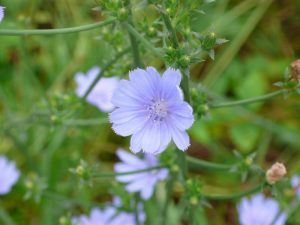 Chicory is native to Europe, but was introduced to the United States. Cultivated varieties include Radicchio and Belgian Endive. In its wild form, the roots can be roasted, ground and as used as an additive to or substitute for coffee. This is particularly popular in the south, where I have had it in my morning cup of joe. 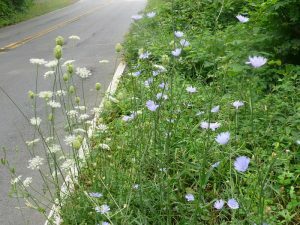 It appears, according to the Wikipedia article on Chicory, that the plant is useful in combating intestinal parasites. Still, I think I'll visit my doctor first. To make a caffeine-free coffee-like beverage from the roots - scrub, chop, and toast them in a 350ºF oven 1 hour, or until dark brown, brittle, and fragrant, stirring occasionally. Grind to the size of coffee in a spice grinder or blender, and use like regular coffee—1½ tsp per cup of water. She recommends harvesting the roots in the fall, so I will give it a shot, then.